The first of the quarter finals was 0-0 at half-time so I was optimistic for a low scoring draw. It finished 2-4! Mysteriously Betfred have not listed (as yet) these two matches in their 1-1 promotion despite the matches being televised. Paddy Power has a similar promotion based around matches finishing 0-0. Their odds for 1-1 look a little tight however. I may have correct score bets on these two matches and if I do will publish tomorrow morning. Del Potro did partake in this tournament withdrawing during the first match against Janowicz, injured. This unfortunately means that your bet has been correctly settled as a losing selection as per the Terms and Conditions. An excellent night at the Ludlow brewery. 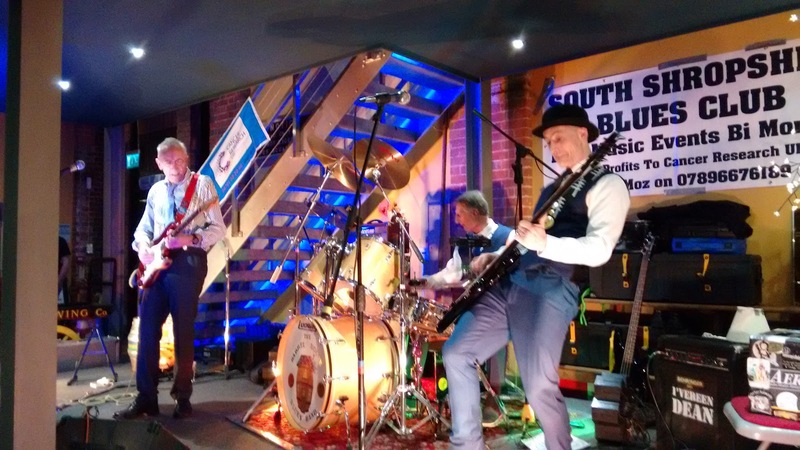 South Shropshire Blues Club kicking up a storm and raising money for charity. 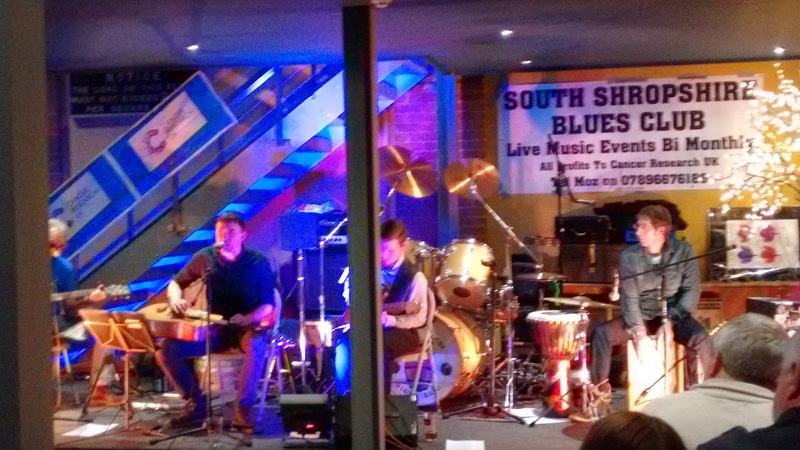 The talented Jack Brett (pic one) was followed by the explosive Barrel House Blues Band (second pic). Reasonably priced ales brewed on the premises. Beer miles equal zero. I won first prize in the raffle too! Next gig 21 March, not to be missed. The Irish comedy bookmaker has settled JM Del Potro as a loser in the Aus Open quarter betting. This is incorrect according to their rules. I am on their case and they won't get away with it. This is not the first time I have backed a player with them who subsequently withdrew without taking part and I faced an initial losing settlement. Even though a small stake is involved I would not hesitate to refer settlement to IBAS as I know I am right. I famously took the dreadful Sportingbet to IBAS over a £20 void bet and won. You can read about that on my website. Skybet has correctly settled the same wager as void. So here's hoping for some extremely tedious sport on Saturday. Switched sports for my next bets. I was impressed with Vika's performance yesterday - a comfortable 6-4 6-2 win over Woza. She looked to be back to her best with no trace of the injury problems which so badly affected her in 2014 and resulted in her ranking slipping to 44 in the world. She is playing even more aggressively than usual - if that's possible - with increased net play. Let's not forget she has won this tournament twice in the last three years so clearly loves Australia. In contrast I've been unimpressed with Serena Williams not only here but in the warm up tournaments too. She is 0-2 against top ten players this year having already lost to Radwanska and Bouchard. 0.5 pt treble above three draws at the prices. Football total stake 5 pts, one draw would return a minimum 5.25 pts. I've rather surprised myself by studying tomorrow's card from the Essex venue. 0.5 pt ew double the above two at the prices. It's back to the FA Cup this weekend. Fortunately my portfolio of four teams has made it through to the fourth round. Two of the teams had to survive replays: Southampton winning 1-0 at Ipswich and Small Sam's Wham scraping through 9-8 on penalties against Everton. Two or three good things came out of the fourth round draw. My four teams avoided each other and they also avoided the so called big four/five: Chelsea, Man City, Man U, Arsenal and Liverpool. The bad news is that these five teams also avoided each other - which was disappointing. If we do well in the fourth round but the market leaders progress let's hope for Man City v Chelsea and Man U v Arsenal to be pulled out of the hat - that would shake things up a bit! If you followed me in with a bet for Del Potro to win the first quarter men's singles with Skybet the stakes should be refunded as he did not take part. My bet has not as yet been settled and I guess it may not be until the semi final places are known. I have also checked both Paddy Power and Boyles' websites and it would appear that they operate the same rule. Boyles just put up 25/1 first quarter. Can't last. Would only lay me 78p. Good to see the big man back. Sydney ATP was his come back tournament and he managed a couple of wins (against Stakhovsky and Fognini) before losing to a qualifier. Being the optimist that I am, I have thrown a couple of quid at him on betfair @ 200.0 to win the Aus Open! Somewhat less of a miracle would be required to reach the last four. He is, however, in Djoko's quarter so there would need to be some significant upsets for him to achieve a semi-final place. 1pt win JMD Potro first quarter Aus Open @ 16/1 Skybet. That's it for the tourney in terms of ante-post bets. May well have some bets during the fortnight however. Good luck if you get involved. My 12/1 EW selection in the Sydney Open will play her compatriot Petra Kvitova in the final in a couple of hours time. The problem here is I suspect Karolina looks up to the dual Wimbledon champion. In a metaphorical sense only of course as she is actually one inch taller! The way Pliskova has played in her last two matches though you have to give her a chance today. She served 15 aces in beating CSN in three sets, finishing the final (bagel) set with four consecutive aces. She then blew Kerber off the court in the semi in just 55 minutes. The two Czech players have met just once on the Tour, the higher ranked player prevailing 6-4 in the third set. On the football front two of my portfolio in the FA Cup are involved in replays. Firstly West Ham host Everton tonight having led 1-0 at Goodison Park until the 91st minute. Then tomorrow Soton, who are going well for us in the league, travel to Ipswich. This could be horribly ironic. Good enough to win at Old Trafford on Sunday but not at Portman Road Wednesday? Must stop being negative! Slowly away in a sense. Could have taken 8/1 A-Rad for this but was concerned how she would be feeling in the first round having just won the Hopman Cup for Poland, beating SW twice in the same day. She took out Serena in three sets then teamed up with Jerzy Janowicz to win the mixed doubles - and the title. As it's turned out she won her first round match comfortably this morning against Cornet, the French woman having beaten the Pole just three days ago. I have added another team to the portfolio ahead of tomorrow's matches. Stoke are notoriously difficult to beat at home (see MU visit for example yesterday). They are on a good run in the Premiership - one defeat in six matches (Chelsea) - having risen to 12th place and may be safe from relegation, as prices up to 50/1 for the drop suggest. I hope Everton can at least maintain their poor run of form for the encounter against one our FA Cup hopes (West Ham) on Tuesday!